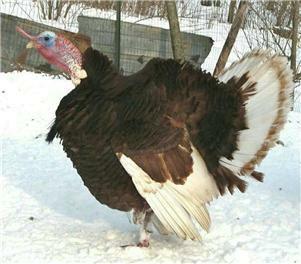 This popular turkey is believed to have been developed from the Tuscarora Red turkey. The Tuscarora, or Tuscawara, was developed in Pennsylvania by selecting Buffs for darker color. The Tuscarora Reds were taken to Kentucky where their development was continued until the deep reddish-brown color of the Bourbon Red was finalized. At one time, they were called Bourbon Butternuts and/or Kentucky Reds, but the name or the variety did not become popular until around the turn of the century when they were promoted as the turkey from Bourbon County, Kentucky then they became known as the Bourbon Red and were excepted into the APA Standard in 1909, and Mr. Barbee of Bourbon County, Kentucky had been given credit for its origin. The standard calls for a dark red plumage with white in the flight and tail feathers. The main tail feathers are crossed by a soft red bar near the end. Body feathers on the toms may be edged in black, though the less black, the better. The neck and breast feathers are mahogany, with a narrow edging of white present on the breast feathers of the females. 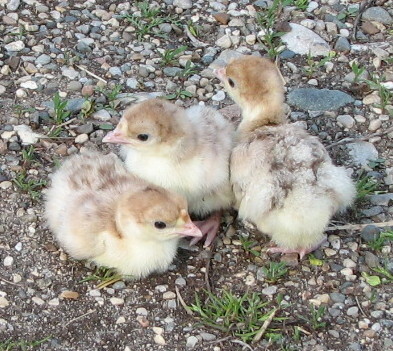 The under feathers are light red shading to light salmon. The beak is a light horn color at the tip and dark at base and the eyes are dark brown. The beard is black and the shanks and toes are reddish pink. Their weights are 33 pounds for old toms and 18 for old hens. 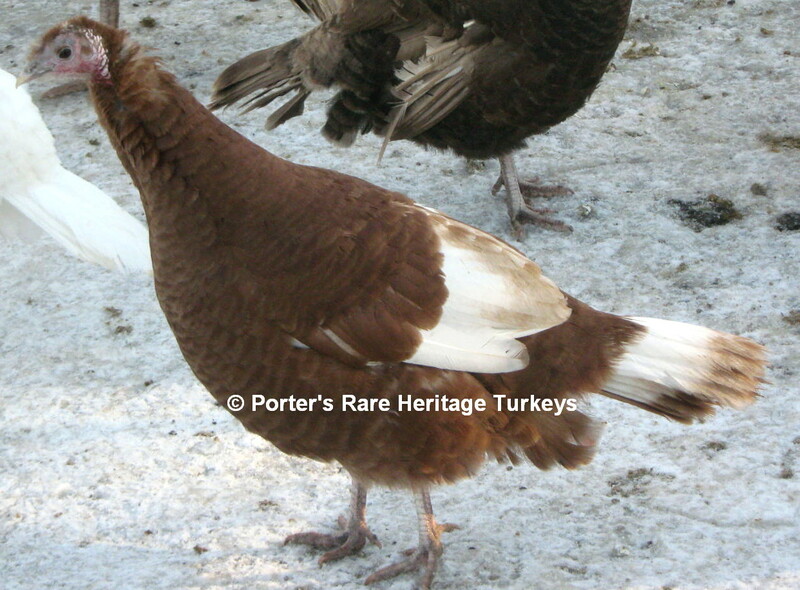 It has been a popular variety for many years, and today it remains the most numerous of Historical turkeys. Their genotype is (b+b+rr) Bronze based and homozygous for recessive red.